Morning is quite a difficult time for anyone. Once you are running with the schoolbags of your kids, stuffing their lunch boxes on the other hand you are rushing for your own daily work. Amidst this hullaballoo cooking becomes all the more difficult. But you can’t compromise with the nutrition and health. That is why you can’t always skip lunch and eat outside. The best way to stay fit, eat healthy and get work done all by a very short time is to use a pressure cooker. You probably avoid the potted pot because of some old memory of shrill, burst and food scattered at every corner of the room. 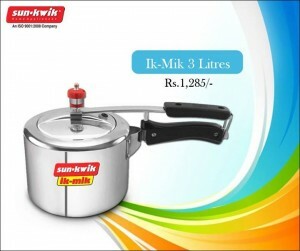 But trust me, now the eminent pressure cooker manufacturers like Sunkwik pressure cooker, Prestige and Hawkins are coming up with the pressure cooker products that are safe to handle. There are a few benefits of pressure cooking. Take a look. • When food is cooked in pressure cooker it retains most of the nutrients and taste. Since you are cooking in a closed pot, a very small amount of heat gets vaporized. As a result most of the nutrients, minerals and food quality remain in the cooker. You get a tastier and healthier food. 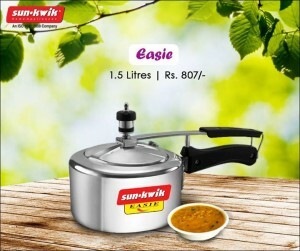 • Pressure cooker is quite well known as an energy saver as well. Since you are cooking in a closed pot it requires a quite low heat and energy to get it cooked. When you are cooking in a closed pot most of the heat remains in the pot itself and it decreases the speed of cooking. As a result it saves quite a notable amount of energy. • For faster and cleaner method of cooking, pressure cooker is a must in your kitchen. There is no chance of juice spilling on the stove top. At the same time you can cook quite fast and than other stove top open pots and pans. • Since the heat does not get evaporated quite soon, the kitchen remains cooler. Buy teh right pressure cooker and enjoy faster and cooler cooking.